Federal American Eagle 9mm Luger Ammo 147 Grain Full Metal Jacket Ammo for sale online at cheap discount prices with free shipping available on bulk 9mm Luger ammunition only at our online store TargetSportsUSA.com. Target Sports USA carries the entire line of Federal American Eagle ammunition for sale online with free shipping on bulk ammo including this Federal American Eagle 9mm Luger Ammo 147 Grain Total Metal Jacket. 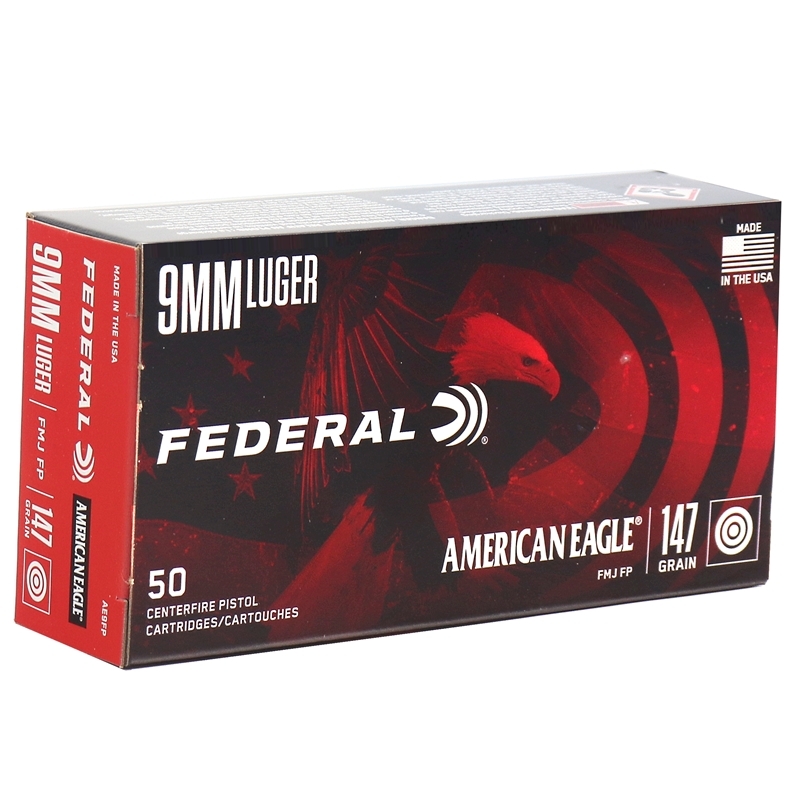 Federal American Eagle 9mm Luger Ammo 147 Grain Full Metal Jacket review offers the following information; 9mm Luger American Eagle ammo line made by Federal is your perfect choice for target and practice shooting. Whether you’re looking for contemporary calibers or a couple of classics, our American Eagle line has what you're looking for. Loaded with clean-burning powders, Federal grade primers and brass, and a choice of bullet styles, shooters know they get quality and affordability with American Eagle. American Eagle ammo is priced attractively and it is considered to be general purpose ammunition. Loaded with clean-burning powders, Federal grade primers and brass, and a choice of bullet styles, shooters know they get quality and affordability with American Eagle. Many of these practice loads offer ballistic qualities comparable to our Premium Personal Defense rounds. Bullet styles include: FMJ, JSP, FMJ FP, JHP and LRN. Throughout the United States, many shooters including Police Departments use American Eagle ammunition for their training. This Federal American Eagle 9mm Luger ammunition is loaded with a 147 grain Full Metal Jacket bullet. The Full Metal Jacket bullet is a good choice for range practice and reducing fouling in the barrel. The jacket extends from the nose to the base, preventing bullet expansion and barrel leading. This ammunition is new production, non-corrosive, ammo, featuring brass cases, boxer primed and is reloadable. 9mm Luger by Federal American Eagle are packaged in boxes of 50 and cases of 1000. 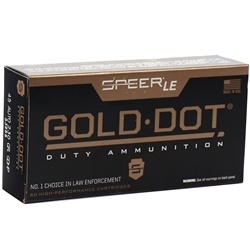 As per our shipping policy, order a case of Federal 9mm bulk ammo, receive free shipping! Federal American Eagle 9mm Luger is used by police departments as training ammunition. I've bought cases and cases of AE9FP for years. It was my favorite 9mm FMJ. However, recently they changed the load, my guess is to save money. 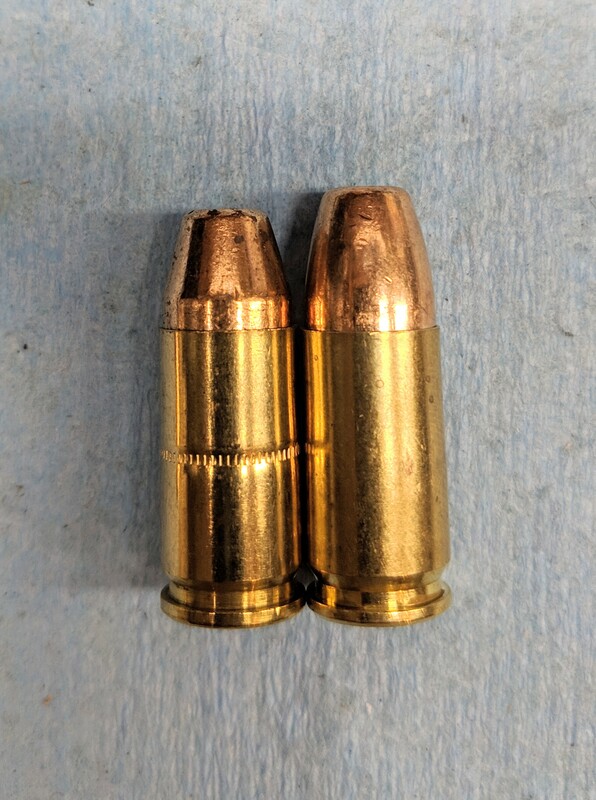 Different shape bullet, no crimped case (see picture). But worst of all, noticeably more recoil. Was my go to competition round, now I'll be looking elsewhere. Solid just dirty ammo. Great Federal American Eagle ammo for the price.